WASHINGTON — Mexico's chief NAFTA negotiator is brushing off the idea of breaking the three-country agreement into separate one-on-one deals. Kenneth Smith Ramos is using Twitter to argue for the merits of a trilateral NAFTA. He said that gives it strength. He made the statement a day after a confusing sequence of events in the U.S. capital. After a Capitol Hill meeting between U.S. trade czar Robert Lighthizer and American lawmakers, one of them left the meeting and said Lighthizer floated the idea of two NAFTAn egotiations: A quick one with Mexico and one later with Canada, which Lighthizer described as more difficult. After three other lawmakers refused to confirm or deny what Lighthizer said and he wouldn't comment, his office eventually reiterated support for a three-country NAFTA. The idea of separate negotiations appeared to hold little interest for Mexico in any case. "The strength of NAFTA comes from its trilateral nature: a region working together in order to compete effectively with the rest of the world," Smith Ramos tweeted Thursday. "NAFTA has strengthened supply chains across [North America] in key sectors such as autos, aerospace, and [agriculture] among others, benefiting [all three countries]." The U.S. is increasingly expressing frustration with Canada in the negotiations — not Mexico. While the southern neighbour was the original target of most complaints from the Trump administration, it's been riled by the northern neighbour's negotiating tactics. 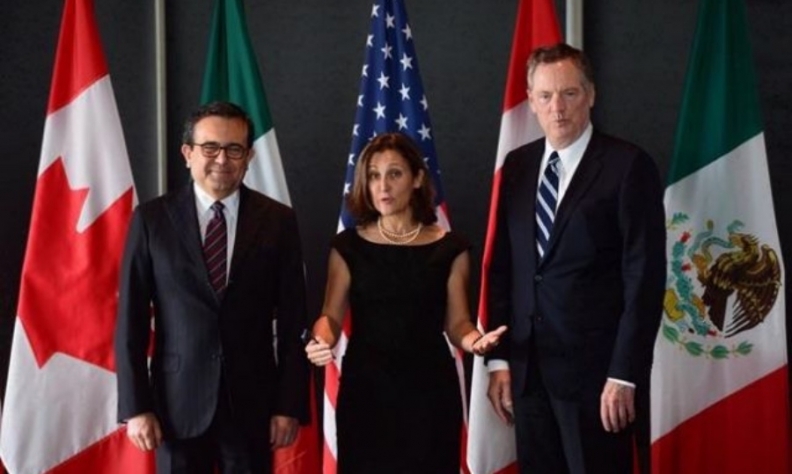 Canadian Foreign Affairs Minister Chrystia Freeland says serious challenges remain in dealing with U.S. proposals in the ongoing NAFTA negotiations. "Serious challenges do remain, particularly with regard to the United States' unconventional proposals,'' Freeland told the House of Commons foreign affairs committee Thursday. Freeland said Canada continues to pursue a "fact-based approach'' to the negotiations and has put forward "creative ideas'' to resolve outstanding issues on autos and the investment dispute resolution mechanism. Her testimony came on the heels of reports suggesting growing U.S. frustration with Canada. He also accused Canada of launching a "massive attack'' on the U.S. trade system by filing a detailed complaint about punitive American trade practices to the World Trade Organization in December. Earlier this week, Ontario threatened retaliation over Buy America provisions, saying it would introduce legislation that would allow retaliation against U.S. states that adopt such policies.